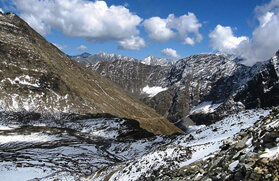 Named after goddess Bhadrakali, Kalicho Pass trek is the route used by Gaddi Shepherd to Lahaul Valley. These shepherds use to take their flocks through this trail. 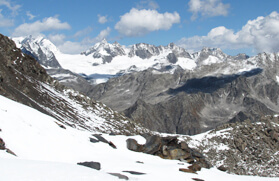 Two completely different geographical regions of Himachal- Lahaul and Bharmour, can be explored in this route. The trail is bit strenuous and adventurous. 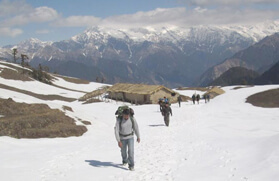 The steep gradient in the trek makes it exhilarating even for the skilled trekkers. A visit to Banni Devi's Temple is considered important before embarking on the tour. 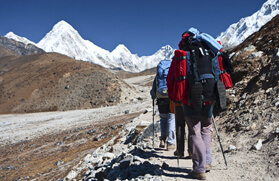 This 12 nights and 13 days itinerary takes the trekkers to a comprehensive and congenial trekking tour to Kalicho Pass. 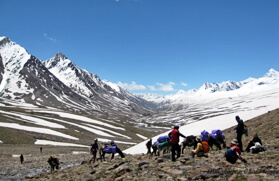 The major destinations en route are Bharmour, Bhadra, Leundi, Bansar Goth, Alyas Base, etc. The trail is brimmed with engrossing vistas of bountiful nature. Take an evening AC train for Kathgodam from Delhi, an overnight train journey. On arrival at Pathankot meet our executive and drive to Dalhousie by road which will take approx 3 hrs. 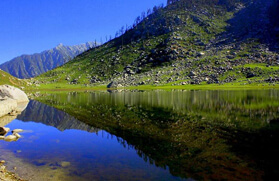 On reaching Dalhousie, check into the hotel and in evening visit local sight seen of Small Hill station Dalhousie. In the morning after breakfast at the hotel in Dalhousie, we will move to the Kalatop wildlife sanctuary and then to Khajiyar. Enjoy the beauty of Mini Switzerland and take lunch. After Lunch, we will move to Bharmour via Chamba. On arrival in Bharmour, check into the hotel. In the evening, we will join the Aarti at Chaurasi temples. Later, return back to the hotel in Bharmour for an overnight stay. We will leave early in the morning today after breakfast with packed lunch for trekking to Bharmani Temple. 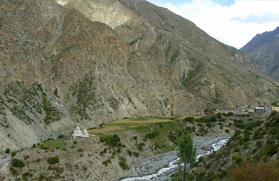 This temple is situated on the ridge and is 03 km trek from Bharmour. In the evening, return back to your hotel for an overnight stay. Our trekking will start from today itself and we will leave early in the morning to the small destination Badgram by taxi. After reaching Badgram, we will start the normal gradient trek of 05 km to village Bhadra, which is the last village on this trek. The trek up to the village Bhadra of 5 km is also adventurous from last destination Baadgram. Enjoy a night stay at village Bhadra. Today we will head from Bhadra to Leundi, which is a nice walk of 12 km. It is an easy walk with a couple of steep climbs through lots of small streams, and there is a small temple at Leundi which is dedicated to Goddess Bhadrakali. The trail is through the dark forest and is nice meadows at Leundi from camping. An overnight stay at the camp in Leundi. Today, we will leave early in the morning and walk on the tough trails that start to Bansar Goth through the steep climb with ups and downs, during this day we might have to cross steams at a couple of places. Bansar Goth has a place for night halt. Locals revered the place as holy as Bansar is believed to the place of Incarnation of Banni Mata. Take pleasure of an overnight stay in the camp. After taking breakfast early in the morning at Bansar Goth, we will move ahead to steep and gradual climbs to Alyas. 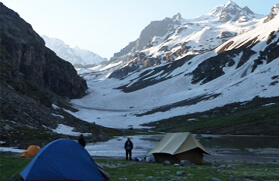 Base ground of passes or camp grounds on both sides of passes are called Alyas locally called Lahesh. After taking Lunch at Alyas, we will enjoy the whole day and revive the body for the next day. Today, we will proceed from Alyas to Kalicho Pass to Alyas, which is about 10 Km track and is totally depending upon the weather and physical condition of the tracker. Generally, our travelling guide will not take the risk or allow crossing the passes in bad weather conditions and will wait for clearing the sky. If sun shines then after taking tea and light breakfast start moving ahead very early in the morning around 4:00 am to ensure that the snow is frozen for easier walking and if fails to cross the pass before 12:00 pm will create a big problem as heavy snow winds, rainfall even snowfall can be happen. 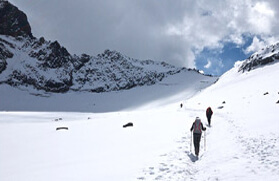 It's the toughest day of the trip to reach on the top of the Kalicho pass takes around 7 hours, though the distance in not much, but the sudden gain in altitude, vertical climbs & taxing terrain makes it an effort in itself. There is a small Kali Mata temple at the top of the calico bass. 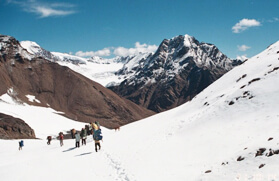 On reaching at the top of the Kalicho Pass, we will go down to another side Alyas or Lahesh. 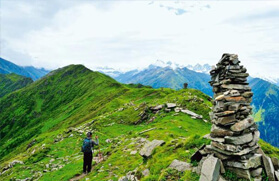 In the morning after breakfast, we will walk on the descent trail is through a stony Nallah from Alyas and reaches at Famous Trilokinath Temple. Rest for an hour at the temple the trails go down to cross the river and join the main highway to Udaipur. Udaipur is the last destination of this trek. After that, all the travelling will be done through the taxi. After breakfast in the morning, we will be visiting the main temple of Mirkla Mata at Udaipur. We will then move to Keylong, District headquarter of Lauhal. After Kelong, we will be further move to Manali via Rohtang pass. We will stay here for one hour on the top of Rohtang pass. On reaching Manali, transfer to hotel for overnight stay. The day is for relax or do some sightseeing nearby hotels by own, later in the afternoon transfer to Volvo station and catch AC Volvo for Delhi by 16:30 hrs. Overnight journey.